What are the communication challenges remote teams face? 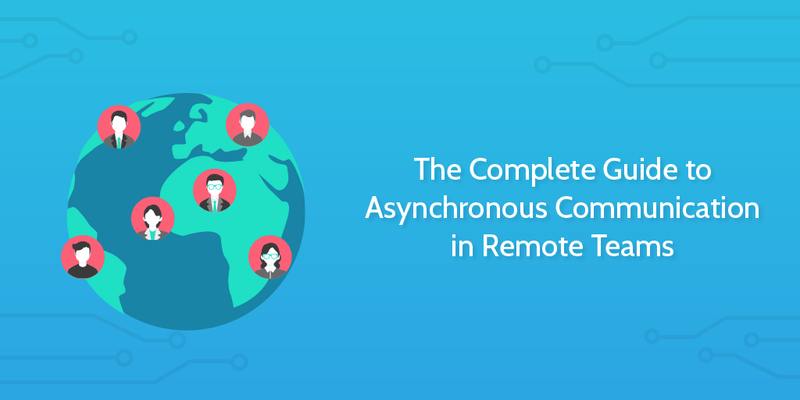 Unlike teams where everyone’s in the office at the same time, remote communication is often asynchronous. What that means is that it’s not a group call where everyone can pitch in with ideas and expect instant responses. It could be hours before you get your question answered, and when you finally do get it answered, what if you need to ask a follow-up question? When done asynchronously, conversations that would take 2 minutes in real-time can take literal days. Think about it that way, and you realize it is a massive problem. Projects can run over schedule, deadlines can get missed, and teams seeking vital information can be left in the dark. 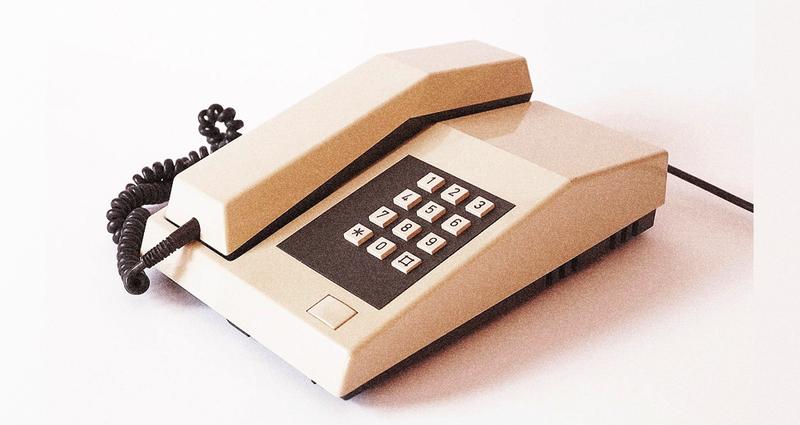 In this post, I’m going to show you how a number of companies solve this issue to make their remote communications smoother, more efficient, and more practical. Synchronous communication is communication where all participants are present at the same time. This could be with video conferencing, or even just instant messaging where the whole group is present. With remote teams working in different time zones, it’s not common for every member to be online and ready to chat at the same time unless a formal meeting has been scheduled. So, asynchronous communication is more likely. Asynchronous communication occurs when participants aren’t always online together at the same time. An example might be sending an email and waiting for a few hours for a response, or leaving a comment on a Trello card to keep someone updated. When communicating asynchronously, you need to keep in mind that the recipient needs more information than they otherwise would, because there’s a chance that you won’t be around to answer important follow-up questions. 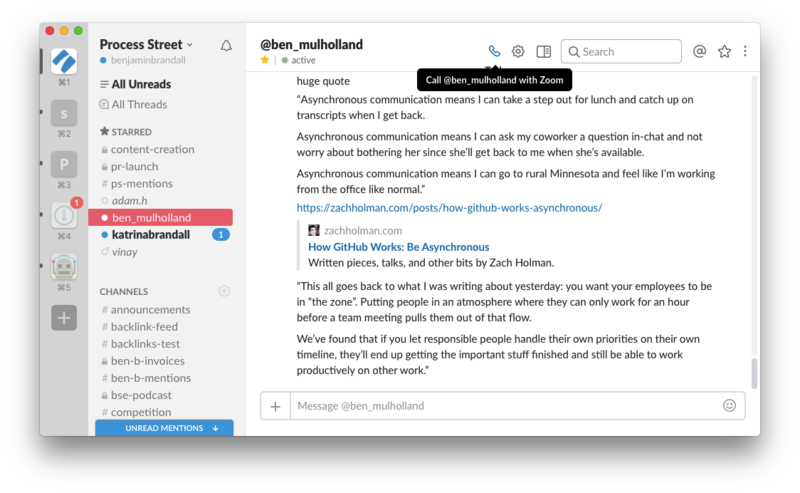 Asynchronous communication is very common in remote teams and describes the bulk of communication at Process Street. Over time, we’ve learned to over-communicate when chatting with someone who isn’t online and has clashing time zones to avoid long gaps where we block each other’s tasks and hurt the team’s productivity. GitHub, for example, works entirely asynchronously. Automattic — the company behind WordPress and Jetpack — also communicate asynchronously. And, they do it so effectively they don’t use any internal emails. Unlike back in the days of Microsoft Office 2001 and a whiteboard full of sticky notes, I can’t just walk up to my co-worker’s desk and have a quick chat. I’m also not likely to call them on the phone to resolve an issue or discuss a task. Sure, call me up on this thing while I’m crushing my workload on the 1996 edition of Lotus Notes. We’re in the age of delayed responses. And that’s actually a good thing. No longer do you force your co-workers to break focus by calling up their desk phone. You also don’t have to schedule awkwardly timed chats (for me, the earliest some people are available each day is 9pm). You don’t even have the pressure of responding on the spot or making someone hold the line while you search around for the information they need in real time. However, it does mean you have to learn a whole new proactive way to communicate, and a lot more can go wrong. Like sending great emails or writing effective processes, asynchronous messages are something you have to learn to do over time. Enough information to cover all follow-up questions. Don’t let yourself be the victim of an open loop; over-communicate if necessary. A deadline. When do you need a response by? How urgent is it? Which task is being blocked right now? Links, images, and as much supporting material as possible. We keep all of our permanent task-related material inside Trello cards, so whenever we talk about tasks we link to the Trello card which should contain all relevant stuff. A concrete need. What do you want to get out of the communication? Approval on a task? An asset of some kind? Be extremely clear. What all of this boils down to is communicating proactively. You shouldn’t need a nudge, or for someone to wheedle all of the information out of you. You should just be able to dump out everything relevant and be considerate about not keeping others in the dark. One great piece of advice from Help Scout (and something Vinay does too) is to lead by example. “Remote work naturally requires a greater investment in team communication, and it’s best to lead by example. I tend to move more in-depth conversations outside of Slack and into a video call. As I’ve gotten to know my team better, I do this more often, and I’ll frequently lead the conversation off topic (or begin that way), just to connect on a personal level. The way to encourage proactive communication is to show everybody how it’s done. Vinay doesn’t send me a “hey Ben” and then waits 10 hours for a response; he provides me with as much information as necessary and expects everyone else to do the same. When team members are physically separate and can be boiled down to just little icons on an instant messaging app, it’s easy to let accountability (and attention span) slip. Yesterday’s “hey Ben” could be today’s missed deadline, unhappy customer, or failed deal. And so, in matters of importance, the responsibility of communicating properly (and repeatedly reminding!) falls on whoever needs something. Another interesting practice Help Scout recommends is to move conversations out of Slack and into video calls when they start to get more involved. Sometimes, it’s practical to move to a real-time conversation just to make freely exchanging ideas and feedback easier. Different tools lend themselves to different kinds of communication. Our time as a remote team has been a learning experience, and we’ve gradually made the shift towards using only the tools that work best for us in each situation. Slack has been criticized heavily for how it encourages time-wasting synchronous communication. “I thought you were providing some relief from the torrential influx of messages, alerts, and notifications I was receiving on a daily basis. “Me + Slack = Fewer distractions and more productivity,” I thought at the time. I have to say, though, that I’ve since found it to be the opposite. …But, as we’ve found, Slack doesn’t have to work that way. While it enables distracting, real-time communication, it doesn’t mean you have to use it for that. In fact, we often use it to provide instructions, update each other on projects, and do everything more traditional offices would do with email. The real problem with Slack? Things get lost. It’s so easy to just dump everything in there and trust other people to save it, note it down or remember it. While Slack’s search is very good, you need somewhere to store all task-related information. For that, we use Trello. 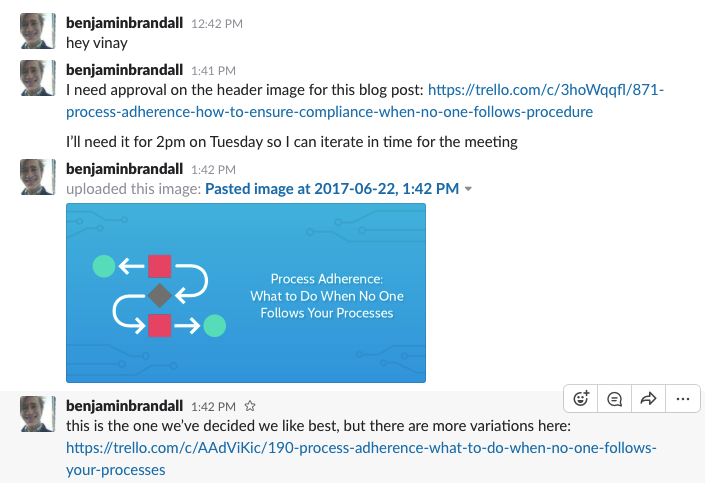 Trello is 100% asynchronous. It’s where we leave permanent evidence of work, attach assets, indicate task status, and more. 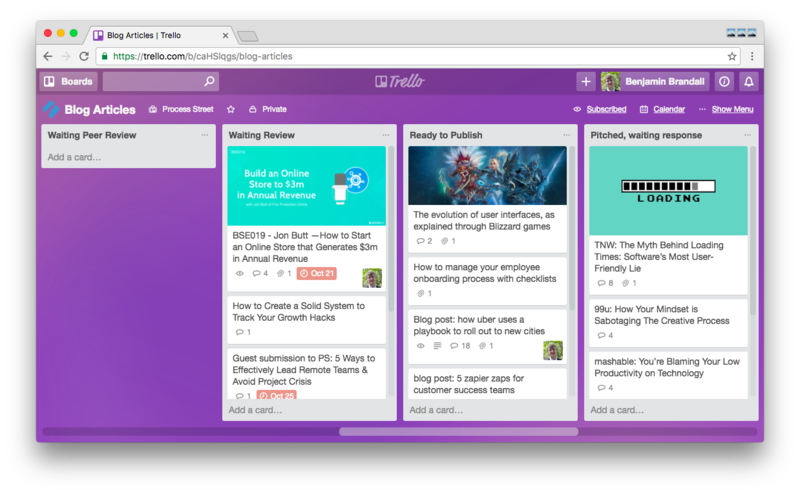 Every submitted task needs to be detailed inside a Trello card, and it acts as the single source of truth. 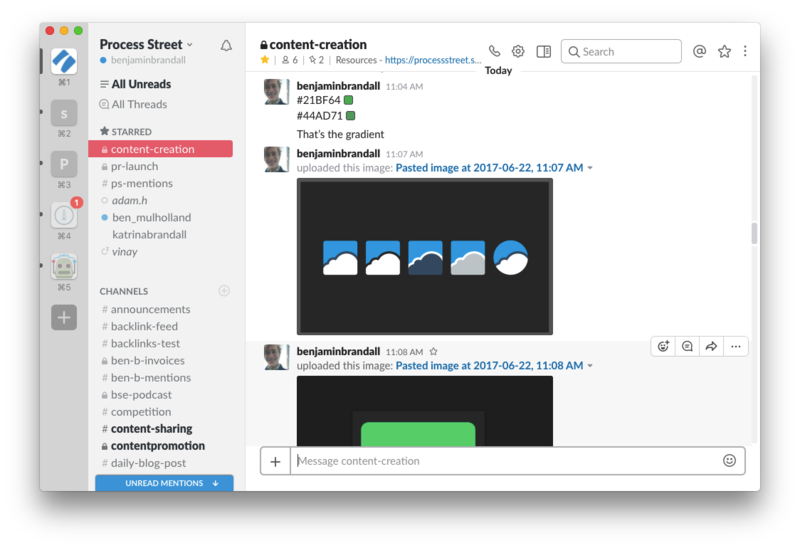 Slack works best synchronously because it’s a very real-time, live environment for conversation. Trying to conduct these kinds of interactions over email is a joke, and I seriously don’t know how teams managed before instant messaging. However, as Help Scout say in their post on running a remote team, when a conversation escalates it’s best to take it into a quick voice call instead. We use Zoom for team meetings and manager one-on-ones. We’ve found it to be stable, easy to use, and with great screen sharing and annotation features. In fact, in our comparison of video conferencing tools, it came out on top. Voice calls lend themselves to collaboration, and speaking is quicker and more expressive than typing if you want to get a meeting out of the way with minimum misunderstandings. While I was writing this post, I had a thought… Isn’t Process Street itself a form of asynchronous communication? Our simple workflow management tool is a way to update your team without bothering them or worrying about getting a response back straight away. It’s an effective way to make information visible and accessible, displayed in a useful way for anyone who needs to know. You can also use comments on tasks if you need to give more details or ask questions. What’s the best way to explain a task fully? From our experience, it’s recording video screencasts. In this post, we describe our method for quickly getting information into video form and attaching it to a Trello card. Similarly, it’s often a good idea to include screenshots in your explanations and requests so the recipient can understand exactly what you’re referring to. When taking screenshots, it’s better to capture the entire page than it is to get just one element. That way, the recipient can get more context on the information. Leading by example works up to a certain point and is great for demonstrating company culture, but sometimes it’s necessary to write guidelines (like we are with this blog post). Buffer, who are heavy Slack users, found they needed to forge a number of Slack agreements to help them get the best out of the tool. You’re responsible for managing your Do Not Disturb settings; make sure to set it so you’re not interrupted during focus time. Everything that isn’t strictly private should be posted in a public channel; it’s more valuable to get other people’s views, and it also helps increase transparency. Make use of Slack’s status and profile settings to show your availability; alternatively, set up a channel where people can make updates if their availability will be different to usual. Set your notification preferences to default; this makes sure you don’t get too many notifications, but also don’t miss important messages. Use threads; threads help cut through the noise and tie messages together for context. Set yourself away when you need to focus; by indicating your status to the team, you’re less likely to be interrupted. Leave unread messages until you have the time to read and answer; Slack can be a real killer when you’re trying to constantly stay in the loop. Use @here and @channel properly; determine whether your message is urgent enough to notify no-one, only online people, or everyone. Reply by the end of the day; like emails, reaching Slack Zero at the end of every day is a good practice so you don’t have much to address in the mornings. These simple guidelines are great for teams to follow if they don’t want to get too involved in the inevitably overwhelming stream of Slack activity. As we’ve looked at in this article, asynchronous communication is an exact science. A science that’s necessary for properly using the tools we have in this remote age. Learning everything from how to write a good message to setting up notifications properly will help you and your remote team just like it’s helped GitHub, Buffer, and Process Street. This is a nice insight! Inspirational! You might want to look at Snagit for screen capture also. I have is set up to record the screen, uploads it to youtube (really quickly) and then puts the link to the video right into your clipboard. It use this 5-6 times per day, it is a huge time saver. Amazing article! Wish I knew this years ago! Thank you for examples!